Nixon has just unveiled its newest collection, which was designed in collaboration with iconic skate brand, Santa Cruz Skateboards. 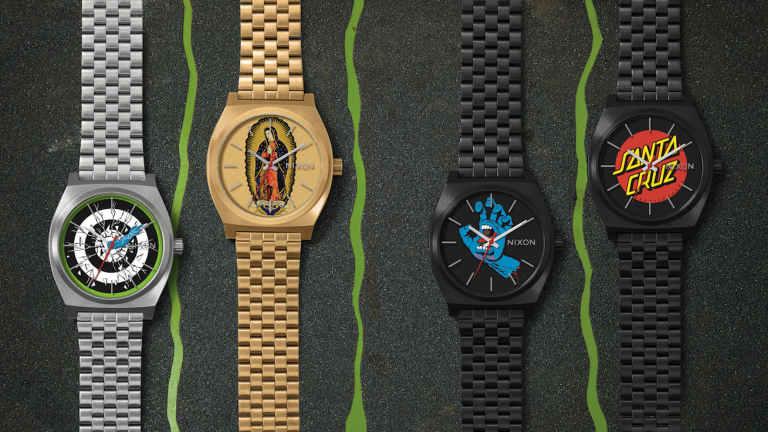 Based on Nixon’s classic Time Teller, the new collection is features Santa Cruz graphics, including the ‘Screaming Hand,’ the Rob Roskopp Arm, Jason Jessee Lady of Guadalupe and the Santa Cruz logo. The iconic graphics were created by renowned artist Jim Phillips, who has served as Santa Cruz's art director for years. Phillips has created thousands of decks, t-shirts, stickers and now, watches. Each watch is made entirely from stainless steel and feature have custom dials illustrated with Santa Cruz graphics. The pieces also feature custom casebacks, co-branding, and exclusive packaging. The Nixon x Santa Cruz Skateboards watches will retail for £110 / €125 / $125. They're available now in limited quantities in Nixon stores and online.